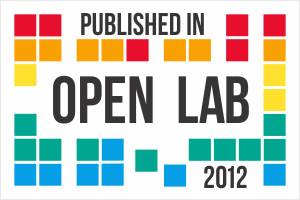 Classic Science Papers: The 2008 “Challenge”! Been a crazy time at work lately, and things look to remain crazy for a couple more weeks! In the meantime, I’m catching up on some of my weird fiction blogging. One of the most remarkable and persistent aspects of the work of horror author H.P. Lovecraft is the consistent and extensive mythology he built throughout his stories. Horrific gods such as the tentacled Cthulhu and the sinister Nyarlathotep that were introduced in one story would reappear in others, or at least be mentioned in frightful whispers. Sinister cities, degenerate beings, and forbidden books of lore are shared between many tales. These “Cthulhu mythos” give the reader the impression that he or she is merely scratching the surface of a larger sanity-shattering reality, and help give the stories the feeling of what is now referred to as “cosmic horror”. Lovecraft’s contemporary protégés added to the mythos themselves, dramatically growing the size of the universe; Lovecraft himself encouraged others to build upon it. The tradition is still going strong, as many authors have written their own mythos stories, and even built their own subsections of Lovecraft’s universe; see, for example, the delightfully unsettling Sesqua Valley of W.H. Pugmire. The novel is told from the point of view of the molecular biologist Morishita Anri. As she arrives for her first day of work, she suddenly has a vivid hallucination of being a young Chinese girl in a World War II-era Japanese prisoner experimentation laboratory designed for biological warfare. As she becomes more and more involved in research on the mummy, the hallucinations progress, telling a story in parallel with the present. The mummy is being studied on the 52nd floor of Japan Gene Engineering, Inc., and the building itself becomes a sinister character in the novel. Its isolated elevators, incongruous arrangement and stringent security protocols form an ever-shifting maze that is definitely not up to fire codes but adds to the claustrophobia of the narrative. When everything goes awry later in the story (as we all know it must), it becomes a deadly trap for the characters. The mummy itself, and the mythology of K’n-Yan, are quite eerie and unsettling. There’s something undeniably creepy about the idea of an ancient creature from a mysterious and uncertain background being recklessly experimented on. The feeling of ancient, brooding evil is captured quite well in the novel, and one gets the impression early on that the mummy represents a “Trojan horse” for humanity. To describe exactly what K’n-Yan is about is much more difficult. Ken drew his inspiration from a Lovecraft story of curious provenance: “The Mound“. The story is officially written by Zealia Bishop, though it was almost entirely ghostwritten by Lovecraft himself based on the basest of a plot synopsis from Bishop. The short story involves the narrator’s investigations of an ancient mound in Oklahoma said to be haunted by two ghosts, one of whom appears in the day and the other at night. With some investigation, the narrator discovers that the “ghosts” are actually guardians of a gateway to a massive subterranean realm in which live the superficially human people of K’n-Yan. The K’n-Yan people are technologically advanced — having even mastered the art of dematerialization at will — and highly cruel and decadent, employing intelligent subhumans as both slaves, entertainment and livestock. Criminals are punished by a trip to the Colosseum, and even in death their mutilated corpses can be animated to work at their masters’ will. 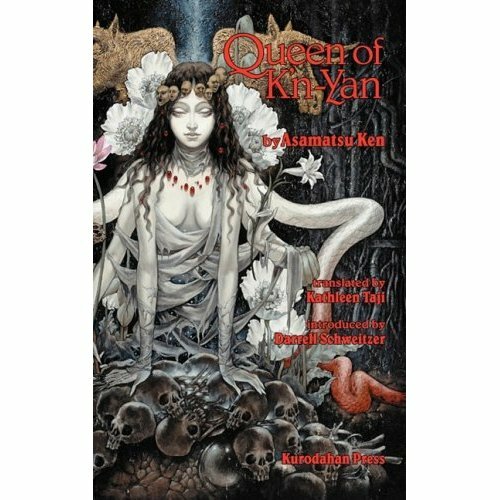 The original story “The Mound” is definitely not one of Lovecraft’s best, and relatively unknown, but Queen of K’n-Yan quite masterfully updates the mythos of the K’n-Yan and makes them more terrifying than Lovecraft was able to. The skills of dematerialization and reanimation are introduced quite deftly and fit naturally into the storyline. Lovecraft is not even the only inspiration for Asamatsu Ken: there is a quite blatant homage to The Thing late in the novel! Furthermore, the principal investigator of the mummy is a researcher with occult experience who carries a book by Edward Bulwer-Lytton on her shelves. This is almost certainly a reference to Bulwer-Lytton’s The Coming Race (1871), one of the earliest science fiction novels and also a story about a secret technologically-superior race of underground dwellers. This is the first time I’ve seen Bulwer-Lytton’s book included in the Cthulhu mythos, but I find it brilliant! The novel is not perfect: the scientific explanations of things are rather confusing and “head-scratch inducing” at times, and the characters do not feel as developed as I would like. Furthermore, some aspects of the story — such as the hallucinations — are not completely explained and feel rather open-ended in an unsatisfying way. Nevertheless, Queen of K’n-Yan was a delightfully creepy book and one that I enjoyed immensely. It is a unique story which is at least in part “science versus sorcery”, and a very clever addition to the Cthulhu mythos. Asamatsu Ken has made the K’n-Yan a (fictional) force to be reckoned with. This entry was posted in Horror. Bookmark the permalink. Looks interesting. I was ready to pass, both because I’m a little tired of the ‘HPL vogue’ and the ‘if it is Japanese it is automatically kewl’ vibes I’ve been picking up online, but it sounds like an intelligent and creepy book and worth checking out! The nice thing is that it doesn’t really feel like an HPL book, because it’s based on work of his that doesn’t have a strong connection to the rest of the mythos! The atmosphere and tone really caught my interest. The author of Skulls in the Stars is a professor of physics, specializing in optical science, at UNC Charlotte. 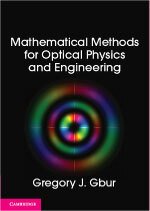 The blog covers topics in physics and optics, the history of science, classic pulp fantasy and horror fiction, and the surprising intersections between these areas.